Celebrate wetland wildlife in your garden with this Ancient Graffiti Copper Colored Hanging Dragonfly Branch Mobile. This fantastic, steel sculpture is sure to add style to your garden, while showcasing your love of dragonflies. A 21" long, curving metal rod evokes a branch, with leaf and twig shapes along it for added realism. 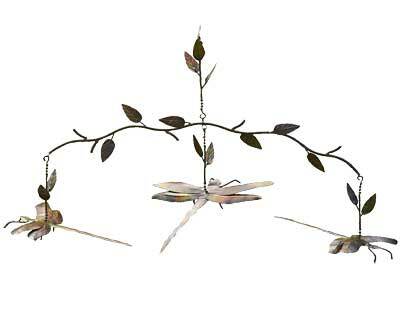 Three dragonfly figures hang downward from this generous branch, evenly spaced for a lovely effect. The flamed copper colored finish with a slight iridescence on the insects' wings gleams in the sun, and impressed veins on each leaf add even more detail to the unit. An attached hook and chain make it simple to hang this item from a branch or bracket in moments, and both the chain and dragonflies move in a breeze for added drama. Enhance the water feature theme of your garden with this Copper Colored Hanging Dragonfly Branch Mobile.